Holy Marriage What a Blessing! Do you come to hear the sermon looking for permission to sin? To lead an unholy life? To live apart from faith in Jesus the Savior of sinners? No way! So, from Genesis 2 the Lord would repent you, faith you in Jesus the Savior of sinners and give you the desire to live ACCORDING TO GOD’S WORD whether you’re married or not. There’s so much that can be said from Genesis 2. If I say everything we’d be here all day. Can’t do that. So just a few points for now. First of all, holy marriage goes all the way back to the “very good” of God’s creation! The very good of God’s creation is that a MAN and WOMAN live together in the estate of holy marriage as husband and wife. This is what pleases God. That is His delight. Not man-man. Not woman-woman. Not even man-woman-woman-woman! Only man-woman. Husband and wife. For life. “What therefore God has joined together,” Jesus categorically declares in Mark 10 based on Genesis 1 & 2, “let man not separate.” Don’t let anyone tell you otherwise — and I mean anyone – especially the doofuses that wear purple clerical collars, have huge pectoral crosses hanging from their necks and sport loads of intricate vestments. If they tell you to do whatever floats your boat sexually, leave PDQ! Holy marriage. Man-woman. Husband-wife. That’s God’s will. His very-good-from-the-beginning-will. It is for your benefit. It is the way of life. One of the main reasons for holy marriage is for the sake of having children. The birds and the bees reproduce. Husband and wife procreate in the context of the covenant or promises made to each other: wedding vows. We are not animals. We are spiritual creatures. Made in the image of God. The one flesh-ness is not just a biological fact. It is a mystery. The marriage between a husband and wife is a picture of Christ’s marriage to His bride the church (Eph 5). In addition, this is how God creates and cares for life via His Word: “Be fruitful and multiply,” (Gen 1:28). We all have a mother and a father. God puts us in families. A specific community with parents! That’s how it works. It’s about life. Children are to be the fruit of married, self-giving love for the other. Anything else is the way of death. And not just physical death if you get my drift. God gave holy marriage when He saw that it was not good for the man to be alone. No doubt Adam had great fun naming, hanging and playing with lions, tigers, zebras, aardvarks, and bears. Talk about a three-ring circus! But no suitable helper among any of them! No companion and counterpart among the beasts, birds, fishies or creepy crawling things! God officiated at this first wedding in the Garden of Eden. What God gave and instituted in the beginning with Adam and Eve is why men and women get married. 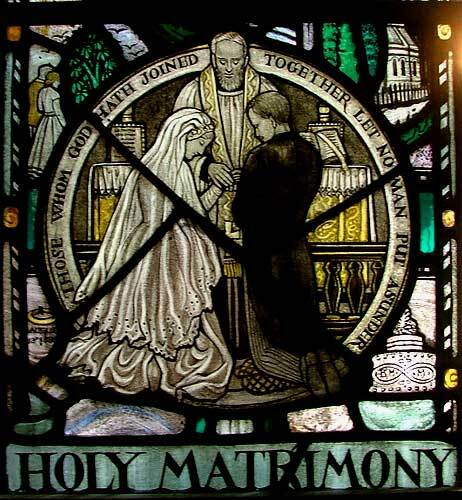 “For this reason a man will leave his father and mother and be united to his wife and the two will become one flesh.” Every time there is a wedding between a man and woman the very good of creation’s beginning is echoed! The text says that the two, the husband and wife, become “one flesh.” That takes place after the wedding during the honeymoon. The one flesh-ness is the physical intimacy that should only take place in bed between the sheets after you’re married, not before. “They were naked and were not ashamed.” Why not? Why weren’t Adam and Eve ashamed to be naked together? Because they are married! Holy marriage is where a man and woman can be naked and not be ashamed. Holy marriage is the God-given protective fence of the one-flesh union between husband (male) and wife (female). So you ladies who aren’t married yet – what do you tell the man? You tell him: “Not until you put a ring on my finger and bring me before the altar! Then … and only then can you take me to the bedroom!” Gentlemen, you who aren’t married yet, you will not even go there! You won’t even try. Give your gal the diamond and marry her first. Then the two can be one flesh. Then there can be the bodily communion between husband and wife that God blesses. Why? It’s simple. Because it is God-pleasing! So don’t mess with what God wants and says about being one-fleshed. We are to fear and love so that lead a sexually pure and decent life in what we say and do. Husbands and wives are to love and honor each other. Physical intimacy is a gift from God not a commodity that we can do with as we please. St. Paul in 1 Corinthians correctly warns us: “Flee from sexual immorality.” Why? Here’s one reason he gives: “Every other sin a person commits is outside the body, but the sexually immoral person sins against his own body.” Therefore, physical intimacy is to be used in the way God has given it. That’s exactly what you as Christians want to do. Right? That’s what I thought. Good. God be praised! Now, when it comes to holy marriage do not entertain romantic illusions. Seriously. Marriage is very hard work. You have to labor intensely at it. And most of life as husband and wife is improv theater. There’s really no script. Marriage is for better or for worse. For richer or for poorer. In sickness and in health. It’s rough and tumble. There are breakdowns and hazards along the way. So, after you’ve been at holy marriage for awhile there are times when you open a sleepy eye and look at your spouse and say in a moment of panic: “What in the world have I gotten myself into?” And you’re tempted to get out. To think about greener pastures. But then you look at the rings you exchanged. Rings that you can’t get off because you fingers are so fat! And you remember the promises you made to each other. Promises that don’t wear out. And you resolve to stick with it. Not because you always feel like it but simply because that is what married people do. They hang in there with each other the way Jesus sticks to His bride the church. This is what it means to be married. It means to sit at the table with each other. Pour each other a glass of wine, take a deep breath and toast the hard work of living for each other in every and any situation. It means going to bed after getting the kids to sleep not with honeymoon passion but reveling in the satisfaction of commitment, fidelity and service to each other. And you know what happens? You discover a depth of love that can be experienced no other way. Living in holy marriage is not a 24-7-365 happily ever after. But you DO LIVE! I have observed over the years as a pastor that many couples who are really dissatisfied with their marriages are completely satisfied years later. Why? Because they just stuck to it. No counseling. No gimmicks. No techniques. Just hanging in there with each other. For richer for poorer, in sickness, in health. Loving, cherishing, forgiving, until one or the other drops dead in the Good Friday arms of the Lord Jesus. Brothers and sisters, if you’re picking up what I’m throwing down, holy marriage is not a romantic ride. Really! Forget romance! Romance is for courtship and dating. Forget romance! That’s behind all you married couples. Ladies, your husband is not your boyfriend! And vice versa! Go instead for L-O-V-E! Now when I say LOVE I’m not talking about the excitement of immature adolescents. Love is not about making sure that you feel good about yourself. When it comes to marital love swim in the deep end. That means husbands loving their wives as Christ loved the church and gave Himself up for her. Men, it means being the head of the marriage. Women, it means ordering your lives as wives and not as a single woman. Being the body of the marriage. It means living sacrificially for each other. Forgiving each other. Bearing with each other. Head and body joined as one. Drawing on each other’s strengths. Working, playing and worshiping together. All right. Just a couple more points and we’ll call this sermon good. I’ve mentioned this over the years but it bears repeating. There are really only two pieces of furniture that a marriage needs. They are the bed and the table. Everything else is optional! Big screen TVs, Barkaloungers, walk-in closets and ironing boards are nice. But marriage needs a bed and a board! A place to sleep together and to eat together. Those are the places of marital communion – fellsowship. Where the liturgy of holy marriage goes on day after day. Usually couples come to me only when their marriage is in deep trouble. Normally I ask them two diagnostic questions: “Do you eat together? Do you go to bed at the same time in the same bed?” And the answers to both questions are usually a big fat “No!” Or “rarely.” No communion! The marriage is like a Christian that never prays, never sings a hymn to Jesus, and never shows up at Jesus’ table except for perhaps Christmas or Easter. What do they call that in the military? AWOL! Don’t go AWOL in your marriage. Tend to your bed and your board! Eat together. Sleep together. Worship together. Communicate. Commune. Notice that the words communication and commune have the same root. Most marriages don’t need more communication. Often married couples communicate very well. It’s just the wrong kind: hardness of heart hurtful, harmful, and unforgiving words. Scorekeeping and bookkeeping words. Learn to communicate differently: mercy, longsuffering, love and forgiveness. The best marriage talk is table talk and pillow talk. In holy marriage the Lord Jesus must be in the middle. The center. He is by the way. Not only of marriage but everything! It’s simply of matter of recognizing this and living from this fact. What does this mean? Well, let me tell you. Jesus made you. He called you into existence. He holds you salvifically and salvationally in His Good Friday death. He has reconciled you to the Father through His divine, shed-on-the-cross-atoning-blood. So, in holy marriage husband and wife deal with each other and receive each other through Jesus. He is the center of your marriage. You are not. Finally, in holy marriage, you must forgive each other. Regularly and recklessly. Jesus pours the good wine of His forgiveness with a generous wrist. Let His forgiveness of you overflow to each other. Oh yes, you’re dyed in the wool sinners but I tell you that your robes are bleached by the blood of the Lamb! You’re real sinners that really sin. However, you are also really forgiven in Jesus. You are given to live in that freedom of holy marriage that goes all the way back to the very good of God’s creation.